I enjoyed this book a lot. It is written by a former RSPB colleague of mine and his knowledge of birds and nature conservation are clearly demonstrated in this book. But he can write too! The long spring starts in Spanish Ceuta on the north African coast at the beginning of February, and ends in northern Norway towards the end of May. Laurence Rose moves with the spring northwards across Europe – looking at wildlife and pondering its beauty, its place in our lives and its future. It’s an engaging book with some good stories about people as well as about wildlife and places. As might be expected from someone who has worked in nature conservation for over three decades, the book has many good observations about how UK and EU nature conservation policies work, and some trenchant comments on how they often don’t. Here is an excellent example, ‘Working around incompetent, uninterested or wilfully destructive governments has become the standard mode of engagement [for conservation NGOs].’. Well said: but this is not a ranting book – it is intelligent and thoughtful, and a very good read. I enjoyed this book right from the start, but the first few chapters popped in to many locations which I know really quite well in Spain, France and the UK and I wondered whether when we headed further north I would still enjoy those chapters as much – I did. I very much enjoyed looking for bears in Sweden, for example. A friend and I talked about writing a similar book to this at about the time that Laurence had already started this one. We couldn’t make it work for us but The Long Spring shows that the idea was in skilled hands already. I did enjoy this book very much. 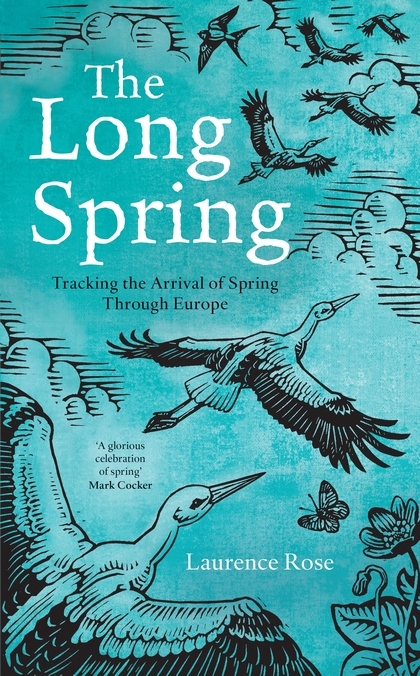 The Long Spring: tracking the arrival of spring through Europe by Laurence Rose is published by Bloomsbury on 8 March. Buy books reviewed here from Blackwell’s and I’ll earn a little bit of money too! I'm really enjoying reading this book at the moment Mark, ordered at our Ashbourne Library. Brings back many birding memories too. Glad you reviewed it!